Libya gets its name from the ancient Greeks who called the people who lived on the land, Libu. The land itself was called Libya. Located in Maghreb region of North Africa, Libya is bordered by the Mediterranean Sea to the north, Egypt to the east, Sudan to the southeast, Chad and Niger to the south and Algeria and Tunisia to the west. A large portion of Libya is part of the Sahara dessert. Some of the first known inhabitants were Berber tribes from the late Bronze Age. Phoenicians then colonized the eastern portion of Libya in the seventh century B.C. and called it Cyrenaica, while the Greeks colonized the western portion and called it Tripolitania. In the first century B.C., the area became part of the Roman Empire, until it was invaded by Arab forces where the empire met its demise. In the early 16th century, Libya became part of the Ottoman Empire. Following hostilities between Italy and Turkey in 1911, Italy occupied Tripoli and then took over most of the land by 1914. Libya was involved in fierce desert fighting during World War II, and Tripoli fell in 1943 when it came under Allied Administration control, after the war. Libya finally became the United Kingdom of Libya when it was granted full independence on December 24, 1951. King Idris was the first and only king of Libya. He had helped the Allies by providing tribes to fight against the Axis of Evil, as well as offering valuable intelligence on German and Italian troop movements during the war. He was responsible for uniting Libya. During his reign, oil was discovered in 1958. In the late 1960s while he was in Greece for medical treatment, and in failing health, he was deposed by a military coup d’état, led by Muammar Gaddafi. The monarchy was abolished in September of 1969 and a republic was proclaimed. Idris went into exile in Egypt, where he later died. Despite most Libyans being born after King Idris’ reign, many demonstrators opposing Gaddafi during the Revolution would hold up pictures of the king to exalt their revered, overthrown leader. The tri-colored flag that was used during the era of his monarchy was also used during the revolution and later re-adopted by the National Transitional Council as the official flag of Libya. Muammar Gaddafi ruled Libya as an Islamic Arabic Socialist “Mass State.” Colonel Gaddafi aligned himself with other dictators and fostered anti-western terrorism. He was highly controversial and an extremely divisive world figure. He had particularly hostile relationships with the USA and the United Kingdom. He was blamed for the Lockerbie bombing of Pan-Am Flight 103 which killed 270 civilians. Gaddafi accepted responsibility for the bombing and paid compensation to the families of the victims, although he maintained he had never given the order for the attack, which was carried out by two Libyan nationals. Gaddafi ruled from 1969 until the Arab Spring Revolution when he was captured and killed in 2011, by rebel forces. At the time of the Arab Spring, there was widespread dissatisfaction with corruption and the unemployment rate had soared to about 30 %. The UN and NATO were very much involved with the demise of Ghaddafi and supported the rebel forces as well as an interim government known as the National Transitional Council. Unfortunately there was not a good plan for what happened next. Today, after the revolution, Libya is seeking to find its way through some very difficult circumstances. In 2012, there was a deadly attack on the US embassy in Benghazi, where four Americans, including the Ambassador, lost their lives. There have been over a thousand terrorist attacks in Libya since the fall of Gaddafi. There is a fierce power struggle happening and ISIS/ ISIL now have a stronghold there, along with several other terrorist groups. There are basically two governments that do not see eye to eye, so in essence there is no government. The people who fought for freedom in the revolution, certainly did not prepare for this type of fight. Many report that life is far worse in Libya after the fall of Gaddafi but they remain committed to fight for a free Libya. During Gaddafi’s reign, the people received free health care, free education, free housing, free electricity and very cheap gas, yet the people were not free. A fight for freedom and human rights is what the Arab Spring was all about. There are many places in Libya which hold historical significance. There are many UNESCO sites, like Tripoli’s ruins of “Leptis Magna”, where the Emperor of Rome, who was Libyan, was born. Some say it is one of the best preserved ruins of that era and was once considered the most beautiful Roman city. The site is large with imposing public monuments. It has a harbor, a market place, houses, shops and residential districts. Another impressive site in Libya is the old town of Ghadames. This is one of the oldest, traditional, pre-Saharan cities, also known as the “Pearl of the Desert” for its stark white façade. Built vertically, in an oasis, its ground floor was used to store supplies, another floor was for the family and then there were overhanging alleyways which created an underground network of passageways. At the top were open air terraces that were reserved for the women. Other UNESCO sites in Libya include the Site of Cyrene, a colony of the Greeks of Thera, with over 1000 years of history. The Site of Sabratha, is a Phoenician trading post that was rebuilt in the second and third centuries AD. The oldest site is the Rock Art Sites of Tadrart Acacus, located on the border with Algeria. This site has thousands of cave paintings dating from 12,000 BC to 100 AD. Unfortunately, this site has been struck by vandals and while UNESCO, along with key Libyan and international partners, are doing what they can to preserve the Libyan cultural, heritage site, it is a challenge in the midst of chaos and war. As we look into the cuisine of Libya, it is a culmination of Mediterranean, North Africa and Middle Eastern cuisines. The Italians, who only ruled briefly, left Libya with pasta, which is still loved today, especially in the west; while rice is a staple in the east. Dried beans and grains are a fundamental part of the food of Libya. Chickpeas are often cooked with tomato and meat sauces for couscous and often added to pasta sauce. A thick, very spicy soup, known as Arabian soup, is widely popular, usually containing lamb or chicken. Pork consumption and alcohol are forbidden, as Libya is nearly one hundred percent Muslim, (mostly Sunni). The capital city of Tripoli contributes the Mediterranean influence and many seafood dishes abound. 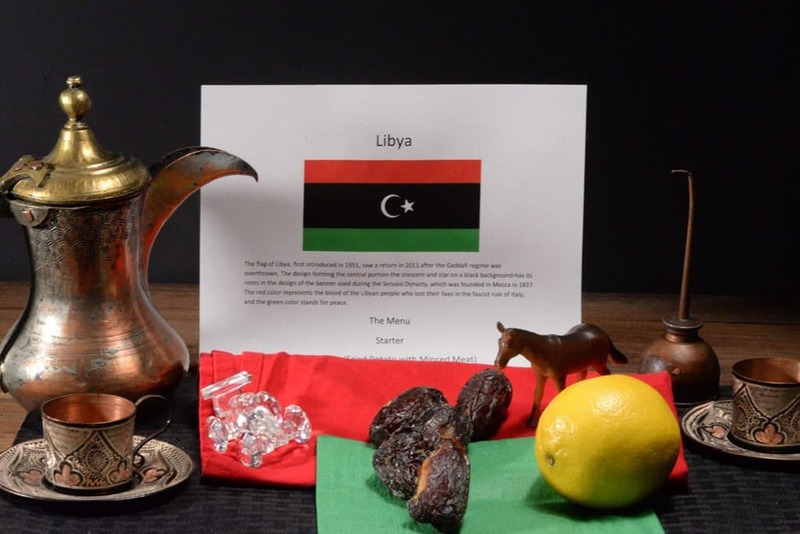 Southern Libya leans toward Arab and Berber cuisine. Fruits and vegetables are found in the many open air markets. There, figs, dates, oranges, apricots, watermelon and olives are abundant. Bazin, or bazeen, is considered to be the national dish of Libya and consists of a rounded, smooth dome made of flour and water that is placed in the middle of the dish, then surrounded by tomato sauce made with mutton and generously seasoned, along with hard boiled eggs for garnish. The dish is eaten with the right hand only, using the bazin to scoop the sauce. So let’s experience a Libyan meal. We set the table with the colors of the re-adopted, tri-colored flag; red, black and green. (The flag during Gaddafi’s regime was a solid green, the only one in the world that had only one color.) We placed an oil can on the table to represent this oil rich nation (80% of their GDP.) We added citrus fruits and dates, as they grow there abundantly. To signify their love for racing we added a formula one car and a horse, as both car racing and horse racing are important events in Libya. The Tripoli Grand Prix was held there beginning in 1925, until 1940, during the Italian rule. An Arab coffee pot and little Arabian cups, rounded out the setting. Our first course was a Libyan specialty, called m’battan. 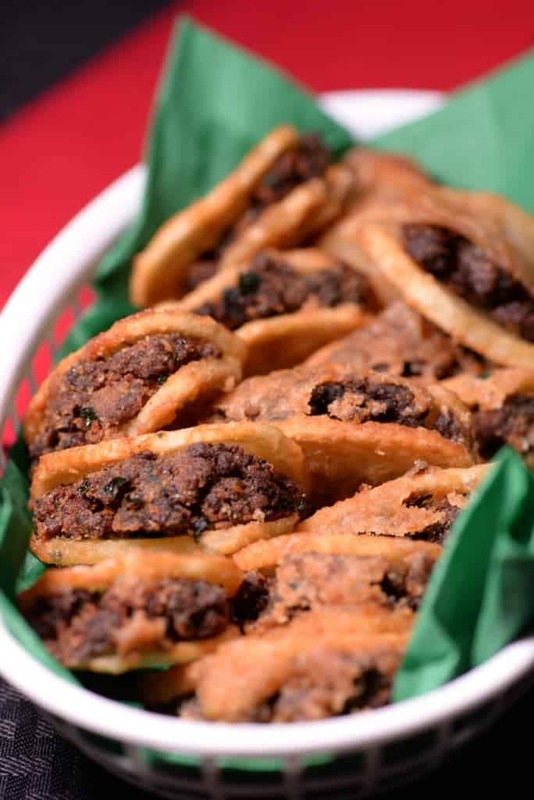 These little treats were fried potatoes, stuffed with flavored, minced meat; a combination of lamb and beef. They were kind of like little tacos with the potato serving as the taco shell. This was a meat and potato lovers’ delight. Next we enjoyed a delicious salad called, Salata Arabiya bil Tufah Albaladi. 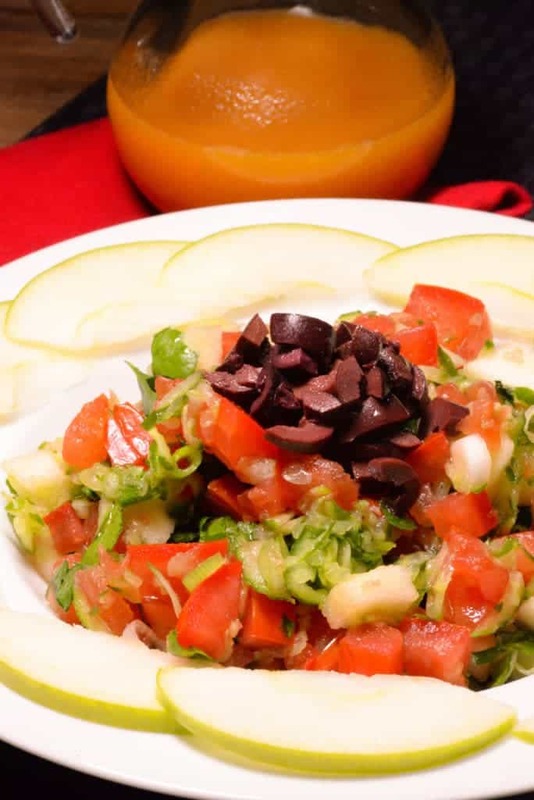 It was made with tomato, cucumber and olives but the delicious twist for this Libyan salad was the apple. Even the dressing was made with apple and it was simply scrumptious. This salad is often served with a can of tuna and would make a lovely, light lunch, on its own. 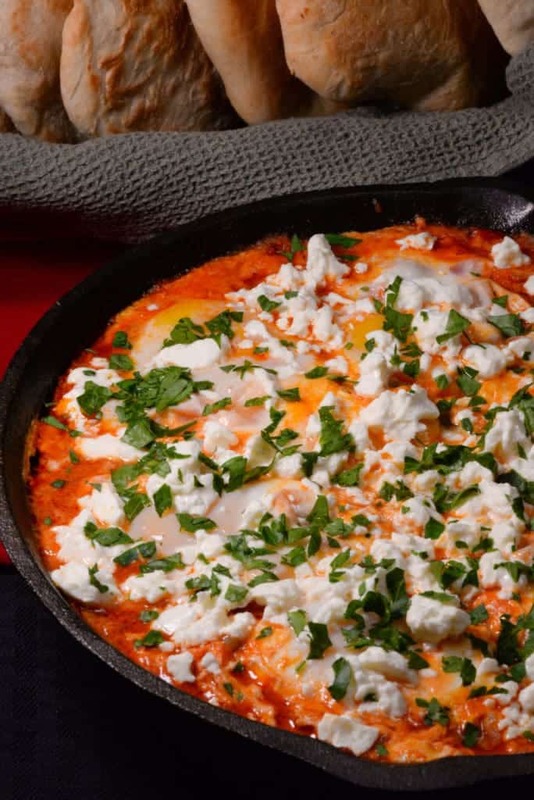 For the main course, we had shakshuka, a poached egg dish in a spicy tomato sauce. (Eggs for dinner, such a concept.) 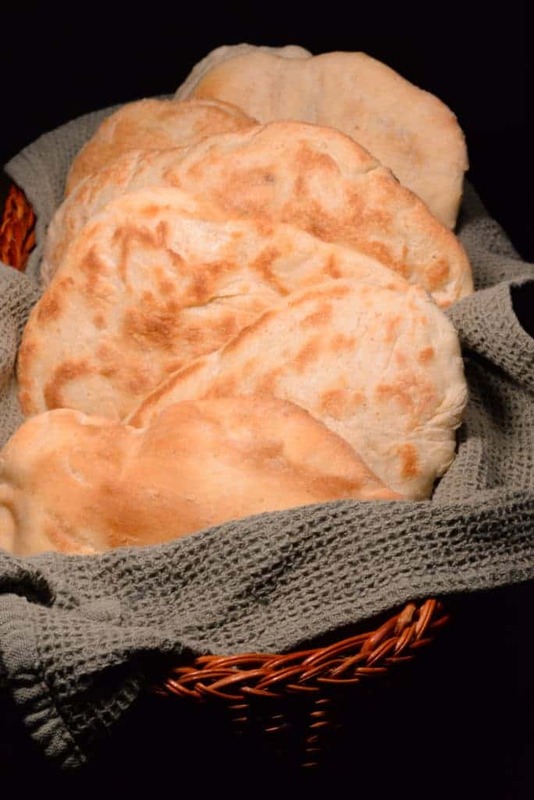 They were awesome and we scooped up those perfectly cooked, poached eggs with an “easy to make” flat bread, similar to a pita, called Khubzit Howsh. This meal could be enjoyed any time of day. We savored it! 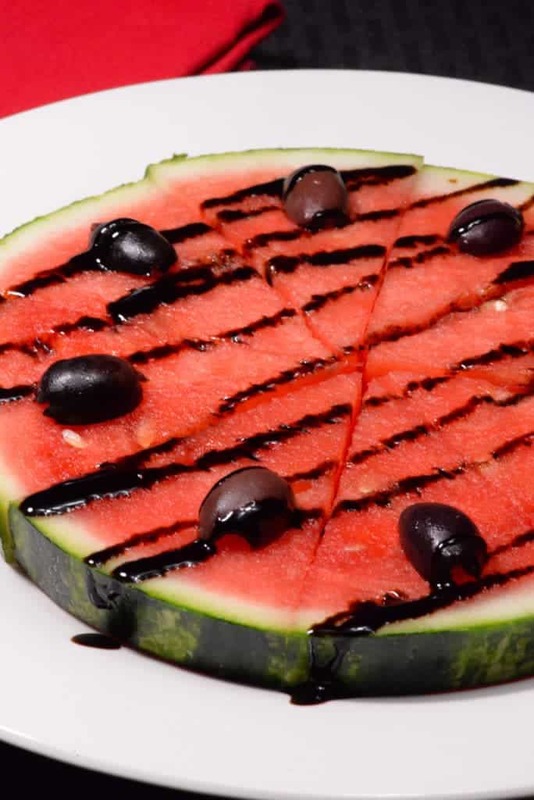 For dessert, we had a simple slice of watermelon. This is a much treasured fruit, especially in the scorching, hot months in Libya. Watermelons are found at road side stands and at open air markets. We served the watermelon ice cold, with a few bits of salty olive and a little sweet and savory, date molasses. A nice refreshing way to end our Libyan meal. As we say goodbye to Libya, in the midst of all that is happening across the world, we can only hope that somehow, peace, love and freedom, will ultimately prevail. Maliciously acquired gold never lasts long. Silence is the door of consent.